Harriet Anena and Prof Tanure Ojaide are the joint winners of the Wole Soyinka Prize for Literature 2018. The announcement was made at a ceremony in Lagos, Nigeria on Sunday, December 9, 2018. The Wole Soyinka Prize for Literature, worth US$10,000, about Shs 37 million is awarded every two years to the best book written by an African. 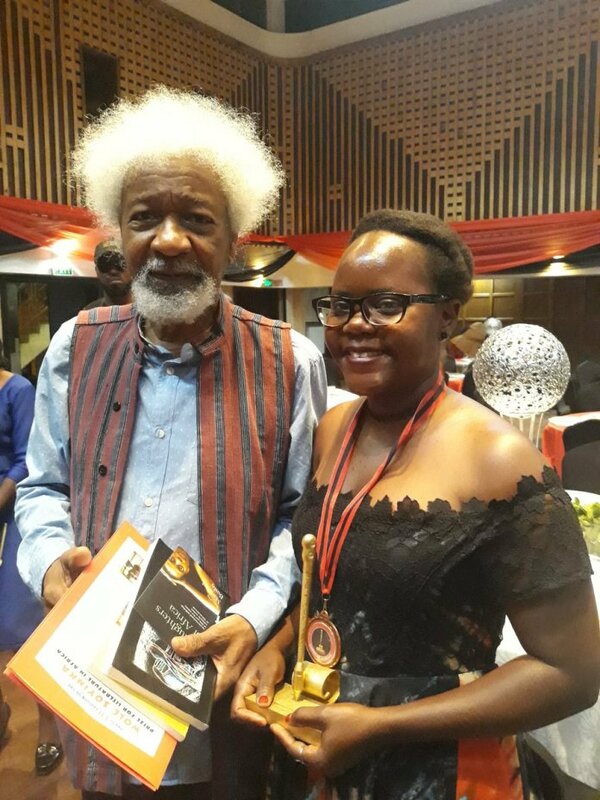 “Super happy to be the joint winner of the Wole Soyinka Prize for Literature in Africa, 2018, for my book A Nation in Labour,” Ms Anena broke the news on twitter. Previous winners of the prize include Sefi Atta for Everything Good Will Come in 2006 and Nnedi Okora for, Zahrah the Wind seeker in 2008. This year’s edition of the prize was for poetry and there were 110 submissions from 11 countries on the continent, including Uganda, Kenya, South Africa, Nigeria, and Rwanda. The ladies have brought home to #Uganda! Harriet Anena @ahpetite won the prestigious Woke Sonyinka Prize for Literature 2018. The long-list of nine poets in the running for the prize was announced early in November before the shortlist of three was revealed later in the month. It was judged by a jury chaired by Margaret Busby supported by University of Texas’ Professor Toyin Falola, author of A Month Sweeter than Salt and the Lagos-based international literary scholar, Olu Obafemi. The winners of the award are Tanure Ojaide for Songs of Myself and Harriet Anena for A Nation in Labour which first launched in 2015. Ugandan Harriet Anena has been making a name for herself in recent years being shortlisted for her prose in the Commonwealth Short Story Prize this year and the Short Story Day Africa 2017 long list. A Nation in Labour is described as a collection of social conscience poetry that paints a picture of the giant politician, the restless citizen, the clueless youth, those struggling to heal from life’s scratches and the ones hunting for words to describe fiery flames of affection. African Center for Media Excellence (ACME) where Ms Anena works has since celebrated her success. “Today [Monday 10] we celebrate our very own Harriet Ber Anena, who this weekend was announced as a joint winner of the Wole Soyinka Prize for Literature 2018. Apwoyo yele!” ACME posted on social media.